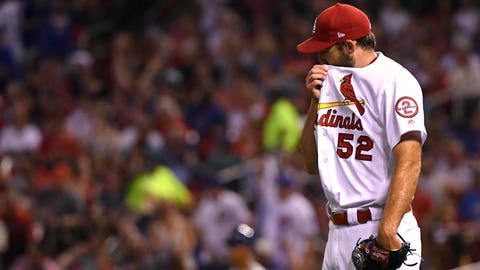 Michael Wacha allowed nine runs, eight of them earned, on seven hits, four walks and a hit batter over 4.0 innings in the Cardinals' loss to the Cubs Friday night. ST. LOUIS — A little rest did Kris Bryant a lot of good. Jon Lester ran his scoreless streak to 17 innings before giving up a solo home run to Marcell Ozuna in the fourth as the Cubs won for the first time in four tries at Busch Stadium this season. Lester (8-2) allowed two runs in 6.0 innings to earn his fourth straight win. Wacha (8-2) allowed a career-high nine runs, eight earned, in a season-low 4.0-plus innings. The three home runs he gave up tied a career high. Cubs RHP Kyle Hendricks (4-6, 3.48 ERA) starts Saturday night against RHP Carlos Martinez (3-2, 2.96). Hendricks has dropped three straight decisions for the first time in his career. Martinez has walked 12 over 7.2 innings in two starts since returning from a lat strain.